Here's the general note on Poverty in Pakistan English Essay with Causes, Impacts and Solutions with full details. Read and download this Poverty in Pakistan English Essay with Causes, Impacts and Solutions and impress your teachers. Poverty is a social problem of Pakistan with the fact that most of the people have limited economic resources and their standard of living is low. The people have been deprived of modern facilities in education, health, communication and good food. Such people are worried due to lack of income resources and they are unable to fulfill their needs’ to live a life parallel to their neighbored. In this age of competition they feel deprived of their rights and inferiority complex prevails upon them. They feel shy in sitting with the well off families. They are not given marital relations with well off people because they are disliked due to poverty. These people are mostly illiterate and their friendship is with the people of same type.. That is why their standard of life does not rise without education and economic resources. Poverty itself is a social problem because the poor people are unable to follow the new trends and they fail to adopt new modes in social life. fulfilled. In frustration they become aggressive and may commit such acts which are criminal in nature. Due to hatred by others they take reaction and get into criminal activities. They destroy the vehicles and property of rich people due to economic disparity. Sometimes a child of rich man is abducted. Sometimes his car is lifted and sometimes” a dacoity is put in his house. This leads to more heinous crime like murder on the rich man. In this way. poverty being a social problem creates other social problems of serious nature. “the word Poverty is derived from French word Pauvre’, meaning poor. Material possession of having little or no more means to “support one self is called poverty”. “Poverty is the inability to maintain minimal standards of food, clothing, shelter and health care”. “poverty not only as economic deprivation, or’ the absence of something but also as a way of life, the” personal of sub-cultural values and attitudes passed down from generation to generation”. According to World Bank, “a person earning less than one US dollar a day is called poor”. Poverty generates illiteracy and ignorance. Many children are unable to get education due to this problem. Millions of children every year prefer to earn instead of education because of economic problem. Terrorists trap Young children and poor youths by giving lots of money and trained them to become terrorists to destabilize the country. Crime and social evils are produced under the. umbrella of poverty. People Commit crime due to poverty. A lot of social evils are also produced because of it. Poverty also hampers economic & social growth of country which disturbs the whole nation. So it is stated that poverty is a social problem and also is, a mother of many other social problems. We are unable to get economic resources from the natural environment gifted by God to us. it is the land, hills, mountains, rivers and falls from which we Can get wealth by our technical skills. We can control and divert the waters flowing from mountains into dams from which power can be generated and the canals for irrigation. The people of our nation avoid hard work and labor. They, feel shy in working down in the street, and on the road. They think themselves to be respectable by not working in labor but wearing a dress clean and tidy. This concept of respect and prestige puts them into dingy house, dirty places to live and low standard food to eat with missing facilities of sanitation in their residential areas. Such people who avoid hard work lead a life of poor man and mostly indulge in drug addiction. They get into heroine, churs and other things of abuse. The prohibited acts get into their habits and they involve in delinquent activities, which leads to criminal actions in life. Jobless and workless people also fall into such habits, which are anti social like, ‘gambling, drinking, cheating, theft and robbery. Such people feel themselves satisfied in associates of these types. They remain satisfied and get things stolen from house for fulfillment of their needs. Smoking and telling a lie are bad habit develop in general behavior of such workless adults. They are idle and useless persons hated by good citizens. They avoid getting into religious education and hate moral and cultural values of Islam. They disobey their parents and elders of family. They walk late at night out of home in company of associates of such habits.. Ultimately they become criminals in adult life. Another cause of poverty is wasting the economic resources. If the savings are not protected the family faces problems in future. Ill health and other necessities of food and dress require money from saving. If saving is poor, then these problems create heavy tension and disturbance on the members of family. Unemployment is the most important cause of poverty. Those young men, who are unable to get jobs can do works of low standards available to them. They can work in farms. They can work in factories and In business centers at low wages. They feel shy to do so and consider these jobs to the below standards. In such cases, unemployment is self created by them, because our culture is simple and non-technical. Employment chances are few for a large number of people. Therefore, unemployment cannot be blamed as main cause of poverty. We can choose other works on construction of buildings, on shoe mending, working with tailors and carpenters, electrical works and works of techniques on machines. There are mechanical works available frequently around us in which job can be taken according to the Wishes of the owner. This minimum and 10w wage also provides a back ground and foot step towards progress of the future. Some people believe that it is the fate1 which is, responsible for our Poverty. No doubt it is true but the basic factor according to sharait of Islam is work and hard work. According to a Hadith of Holy Prophet (peace he upon) “one Should adopt any profession for earning his livelihood. Here adoption of profession has not been said as the only principle. He must be expert and highly qualified and trained in his profession that his work is free from mistake”. We see today the western countries are followers of this a Hadith and we go there for higher education, medical treatment and for equipment and machinery because they are expert of all these productions. This hadith as narrated by Imam Ghazali in his book “Kemya-e-Saadat”, the great imam of the time said that Muslims take wrong meaning of “Twakkal”, that is why they remain poor. It does not mean to wait for better results Without works. He says that work is basic foundation for the result of success. Some people have wrong religious beliefs in future events of life. They say that Allah will forgive all Sinners by virtue of His mercy. This is wrong interpreted because Allah presented a principle of judgment between right and wrong on the Day of Judgment. Every good and bad event will be measured on the scale and man will be rewarded or punished accordingly. He can do mercy upon any one whom He likes, but this is not general principle for all. Those who believe in this authority of Allah, are misguided persons. Because Allah said that He does not deviate from His principles laid down by Him in the Holy Quran and this principle has been described by Shah Wali Ullah Mohadith Dahlvi in his book “Hujja-TulIah-hu-Balgha”. Control on wastage of resources must be made for the preservation of resources of the people. Technical and non technical training to be provided to those people who are without work. Illiteracy is also a major reason of poverty as illiterate person possesses less potential and skills. He is not well groomed and trained for getting better economic and social status in society or a higher and prestigious job. Therefore, he is trapped in the net of poverty forever. Ignorance is also one of the main reason of poverty where people have better economic resources are victimize of this cause. As people of the rural areas of Pakistan sell their acres and spend the whole life and money in judicial proceeding with their neighbor or Counterpart Without knowing and calculating the losses and benefits. When resources are not enough to meet the basic needs of life, people sometimes do not abide by the law and commit crime. Due to poverty, economic crimes are committed in society such as robbery, dacoit, kidnapping etc. Poverty creates beggars in Society. Most of the beggars in society are begging ,due to poverty not due to cultural constraints. This includes deaf, dumb, disabled, old aged, children, widows etc. Poverty cerates social evils in society. Due to this, people are unable to follow the norms and values of society. In result they become the victim of social evils. Generally, poor are the victims of addiction like, heroin, alcohol, marijuana etc. These kinds of people are usually found on the foot path of the roads in unconscious state. They even some times are unable to tell their name and whereabouts. Poor generally are unable to follow the norms and values of society, hence they violate for the sake of money, food and shelter. Poor enjoy low quality of life in every walk of life. They are unable to get better education, avail better health facility, live in better place and house, and eat better, delicious and hygienic food. Hence there quality of life is very poor. Due to above mentioned consequences and impacts of Poverty; poor people do not enjoy better social status in society. They are considered at the lower bottom of society. Following are the solutions of poverty. People should be given It should be effort of the government that no one should remain unemployed. At least, every one should earn and meet own expenses of life. Unemployment should be converted into employment and hardworking. For this purpose, people who do not want to do. menial work should be persuaded and given incentives to do all kinds of job. Those who are poor and beggar may be given technical education. In this way, their potential will be utilized in a better way. For this purpose, special technical training institutes for the beggars may be started in every big city of the country. Our society is lack in saving and people use to spend more than their income. This kind of attitude is one of the major factors of under growth and poverty. People should be given incentives and motivated to save more for the coming generation. This kind of culture may be promoted. People should be given technical and semi technical education. This kind of education may be extended up to the rural areas because incidence of poverty is more in rural areas than the urban areas. Finial assistance may also be given to such kinds of people. Importance and benefits of the education and literacy may be conveyed to the people because education enables individuals to get better jobs in society. A special effort may be started for the rural areas because illiteracy is more in rural areas. Women are the fifty percent of the population. Very little chunk of the women of our society are well educated and doing job. They should be given technical and vocational skills, so that they could start some work at their home. In this Way, they will remain in the house and productively utilize their free time. 68% of the total population lives rural areas Most of them are attached with the agriculture. I agriculture is enhanced.and made more profitable business, positive impacts on the poverty reduction can be observed. Therefore, agriculture may be improve.d by introducing new technology, seeds, pesticides and other agricultural inputs. Problems related with agriculture may also be addressed on priority basis. Status of infrastructure may also be improved. New roads, bridges, Water supply schemes and health facilities should be constructed up to the remote areas of the country. Farm to market road may also be constructed on emergency basis because Pakistan is an agricultural country. 1t is need of the time that farms should be well connected to the market. Already a number of micro credit organizations and banks like Puhjab Rural Support Program (PRSP), National Rural support Program (NRSP), Khushhali bank and first micro credit bank are giving small, credit to the poor people to start business or enterprise. This kind of services should be extended up to the remote rural areas of Pakistan.. The most important step is to reduce population growth. There should be harmony between economic growth and population growth. Without stooping it, every step taken to reduce poverty will be futile. So this hold be given due importance. 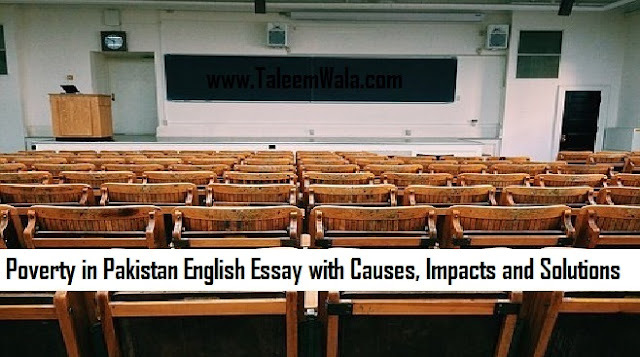 If you need to read more English essays for Pakistani students then look around at our website and stay connected.